The GOTHAM, ex SOCONY 11, built in 1951, was once the flagship of Mobil Oil's NYC Fleet. 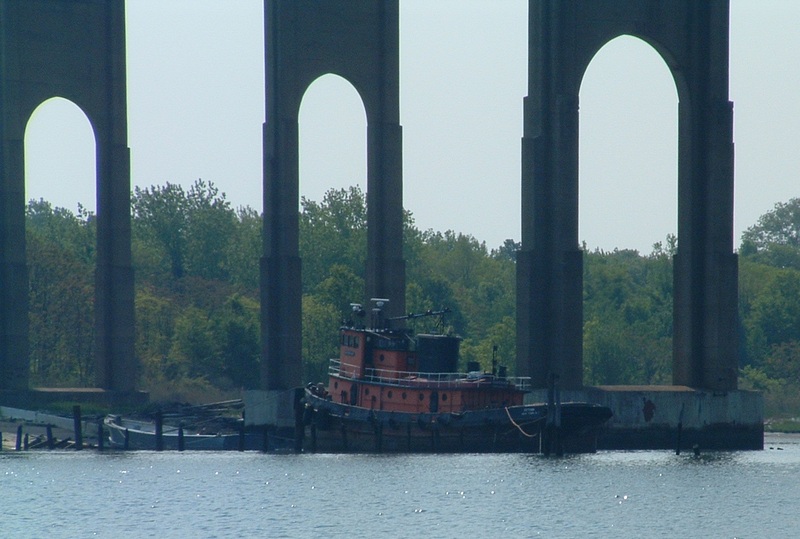 Even in the 1970s, she was the fastest tug in the harbor, but, in 2004, she floated but hadn't moved from a spot beneath the Outerbridge Crossing for so long that those who knew her felt she would never again move by her own power. A day before she was to become a reef, the GOTHAM became the property of Mike Vinik and Mike, to some, became the laughing stock of the harbor. "Everyone" knew the vessel. They saw her classic lines and knew her proud history. They also knew of her burst pipes and declaration as a "total loss" by the insurance industry. They would be sad to see her go, but, what could they do. They knew the GOTHAM couldn't be repaired. But, they didn't know Mike Vinik. At 12, Mike taught sailing to day campers. In high school he'd worked for a sail manufacturer then a marine supply store and earned his Eagle Scout with a Bronze Cluster. He graduated high school at the Marine Academy of Science and Technology on Sandy Hook, NJ and earned their Marlin Spike Seamanship Award at graduation. In college at SUNY Maritime he become an EMT, volunteered at Ground Zero ON "9/11," and earned licenses in deck (to run a ship) and engine (to be the engineer). He served as Assistant Port Engineer for Weeks Marine, then as a deck hand on a tug, then as a ferry Captain for NY Waterways. He was working full time as a mate on the SANDMASTER, a tug pushing the dredge off Sandy Hook, but wished ultimately to become a Sandy Hook Pilot. During the summer of 2004, a year after graduating from SUNY Maritime with a BS and a Mate's license, Captain Mike Vinik purchased the GOTHAM and founded Vinik Marine. He purchased the GOTHAM and created Vinik Marine to prove his worth to the Sandy Hook Pilots and to have an income during their lengthy training period. It took 9 months of crawling through the sludge in the bilge, replacing frozen pipes, repairing cylinders, sleeping on cold winter nights aboard a vessel with no hot water and no heat before the GOTHAM ran. Word spread. Many who had watched became Mike's maritime friends. It's always good to know a guy who can raise the dead. They helped him get a few jobs. Things were tight. It was cold and quiet on Raritan Bay but sometimes he got 2 jobs a week, and, though they might be at 1 in the morning and access to the tug was made in an open aluminum skiff, at least it was work. It wasn't until the summer of 2005, that the GOTHAM was christened the DOROTHY ELIZABETH in honor of Mike's grandmother Dorothy Elizabeth Azzolino. In May 2005, Don's article about the rebirth of the SOCONY 11, the GOTHAM, the DOROTHY ELIZABETH, made the company and Mike "tug boat rock stars" and the talk of the harbor. With an impressive showing by the tug, her captain, and her crew at the 2005 Tug Boat Race came a few more jobs. Mike and the DOROTHY were laughing stocks no longer. This picture, taken by Steve Munez at the 2006 NYC Tug Boat Race, shows the Dorothy "ahead full" with flags and "crew members" as decoration. Assisting, litering, and towing at all hours of the day and night brought some income and the need for more crew. Classmates at SUNY Maritime and even a pizza delivery guy or two joined the crew. As the number of crew members grew, the number of Maritime graduates and their family members working at Vinik Marine also grew. They are really a world class crew! 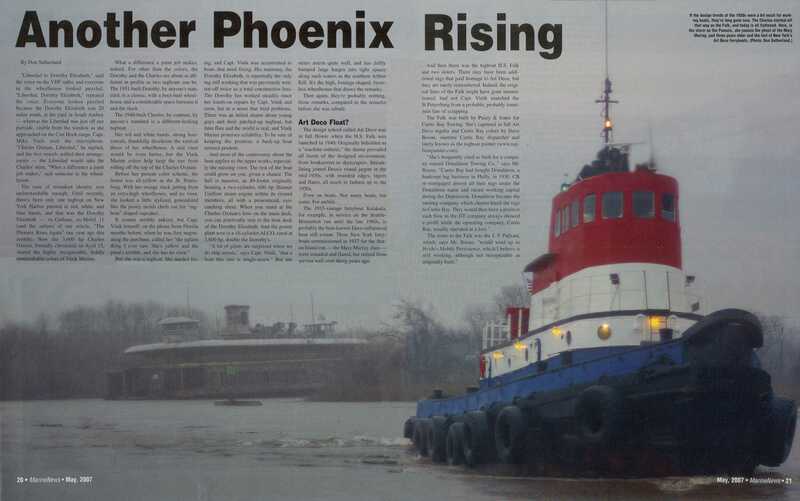 May 2006 brought Don Sutherland's second article about Mike, Vinik Marine, and his "newest" tug, the CHARLES OXMAN, ex H. S FALK. Mike had done it again. This time it was in Tampa, again, with a vessel that never moved. At least the CHARLES came home to port on its own power all the way from Tampa. As the CHARLES entered NY harbor off Sandy Hook, Mike Vinik watched from the Pilot Boat. He'd been accepted by Sandy Hook Pilots and had left the CHARLES on its voyage to NJ in order to report for duty as a pilot in training. 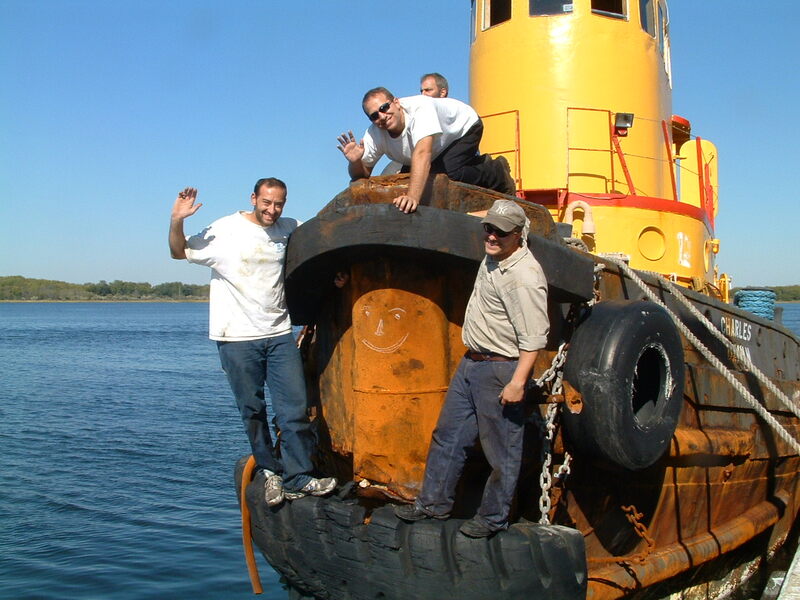 Shortly thereafter, Mike left the Sandy Hook Pilots and he and the crew turned the CHARLES into a working tug. Vinik Marine employees fill dual rolls -- deck (steering and handling) and engine (maintaining and repairing) -- unlike most maritime counterparts. They choose a worthy classic vessel, restored or rebuilt it, and turn it into as a working vessel. Take a World War II veteran, remove the debris of it's prior life, chip away the rust and the old paint job, add a red-white-and-blue paint job, new radar, new computers, even a new galley. Make the brass shine and the stack display the red white and blue VM logo. 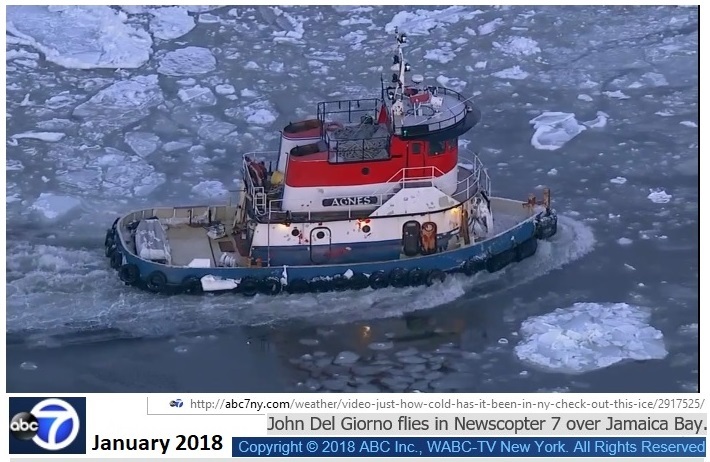 Rename the vintage vessel in honor of a loved and respected individual -- one worthy of being hailed on radios through out NY Harbor and beyond -- and use for ordinary, fairly unique, and truly unique tasks. That's become the Vinik Marine routine. There have been losses to Vinik Marine. Hurricane Sandy did the most damage. During Sandy Vinik Marine lost the Robin Kenneth, a crew boat named after Michael's father Robin Kenneth Vinik, and the Teri Lou, a WWII yard tug named after Michael's aunt Teri Lou Azzolino. 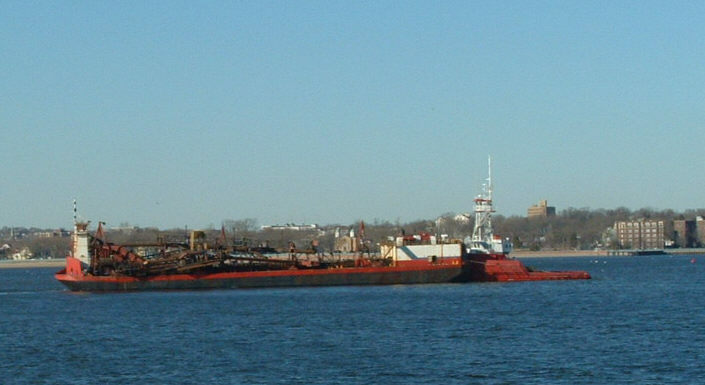 At present the fleet includes the mothballed MIKE AZZOLINO, ex YANKTON (WYT 72), the CHARLES OXMAN, named after dear family friend Charles Oxman and often honored as the Best Vintage Tug at a race, the VENUTRE (a 100 passenger party boat), and the Agnes, named after Mike's mother Agnes Azzolino. 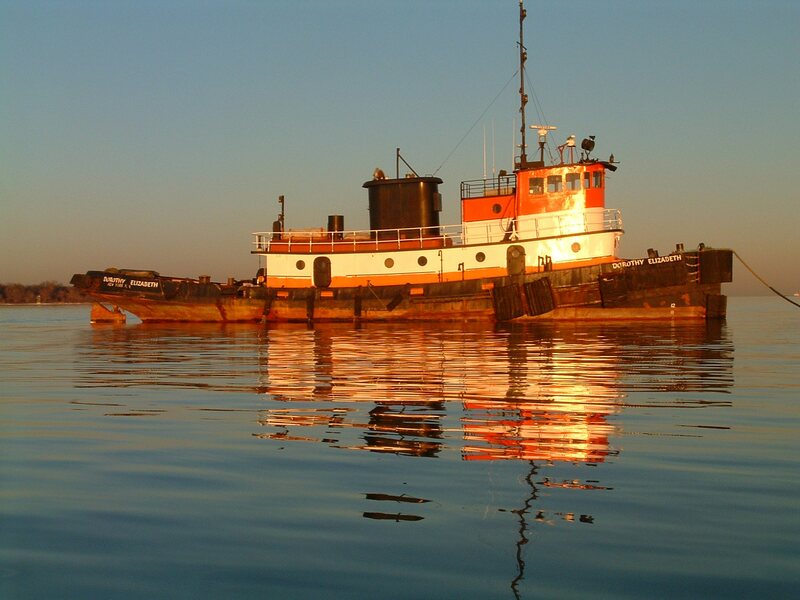 The DOROTHY ELIZABETH, the TERI LOU (a 40 foot tug or push boat), and the ROBIN KENNETH are no longer with us. At Vinik Marine, each day brings a new adventure. Routine jobs include ship and tug barge assists, and litering (taking "small" loads of road salt & stuff off a larger vessel too big for "shallow docking" and bringing it to a location from which it can be used). 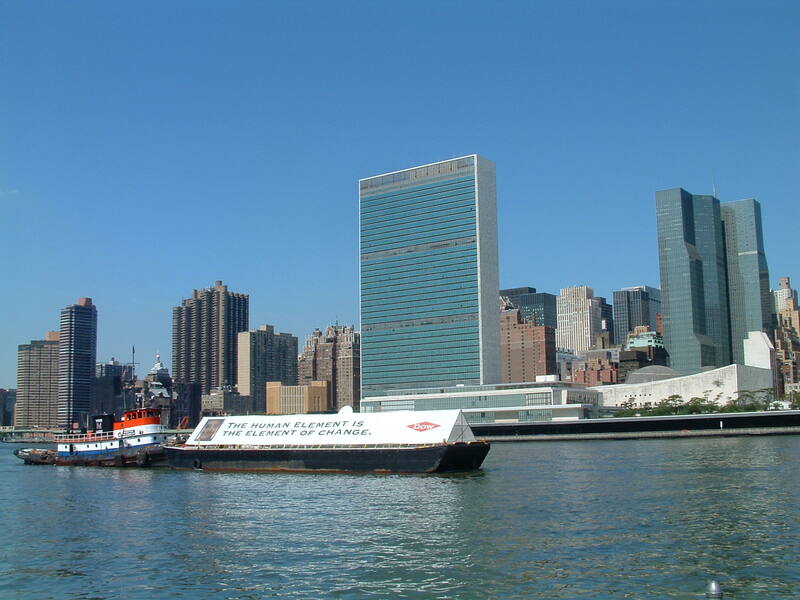 There are really unique jobs, like designing, building, and floating a 30' by 100' foot bill board off the UN in the East River so Dow Chemical could advertise their "Human Element" marketing campaign to those meeting at the United Nations. Each day brings a sunrise and a sunset, often while traveling past the Lady in the Upper Bay or quietly off Roseville, the tug boat graveyard. When days are spent in the bays and rivers of New York Harbor, new adventures do happen. Sometimes one even gets to name a tug in honor of a beloved grandfather or good good friend. 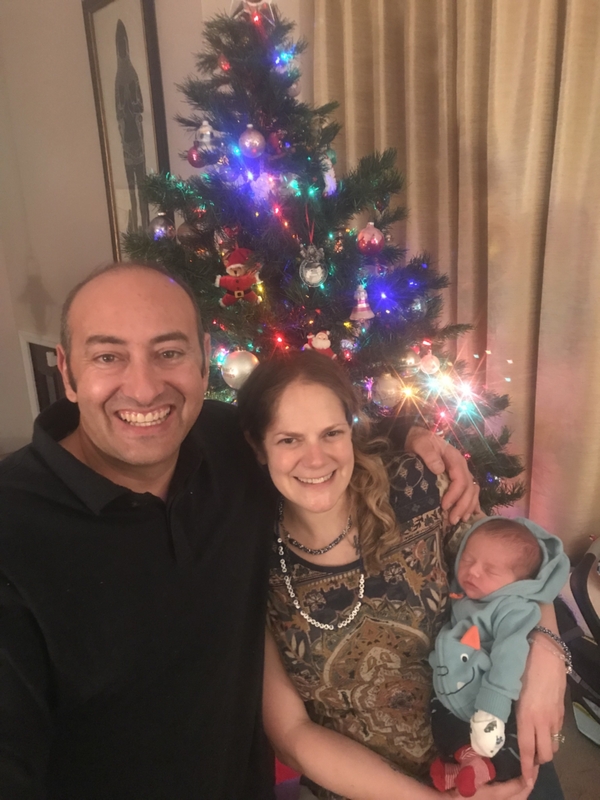 2017 was a wonderful year! Captain Mike Vinik married his lovely wife Liz Vinik and they welcomed son Nicholas Charles Vinik to the family. Vinik Marine welcomed the MIKE AZZOLINO and the LIZ VINIK to the fleet. It's January and it is cold in New York City. The AGNES and the LIZ VINIK are both breaking ice to keep the ferry lanes and docks open. The AGNES is caught on camera by a TV news crew (see left) and another crew films and interviews the tug and crew. It's a lovely start to another year.